Should You Build a Data Warehouse or a Marketing Database? Which is the better vehicle to increase profits by building relationships with your customers and understanding their motivations: a data warehouse or a marketing database? Two experts who have dealt with this problem in a major company show us the answer. Alexandra Morehouse, and Daniel St. John worked together on database marketing projects for American Express for fifteen years. Eighteen months ago they joined the California State Automobile Association as VP for Membership Relationship Development and Director of Database Marketing respectively. Their assignment: build a data warehouse. They were given a budget of $17 – $22 million. The California AAA is a massive 100-year-old organization. It has 7,000 employees in 80 different offices throughout the state. It provides road service, insurance, travel and other services. It is the largest travel agency in California. Its 102 different legacy systems had never been combined before into a single marketing database. There was a lot of data but very little information. People throughout the company needed the information and could not get it. The data warehouse project was huge. Alexandra and Daniel knew from experience that a data warehouse takes two years or more to build. They had seen other organizations get bogged down building warehouses which were never used, and which lost support from top management because of the costs and delays associated with their construction. They did not want to have this happen to them at the California AAA. So they took a very brave step: they turned down the $22 million, telling management that they could build a marketing database for less than a tenth of that, and have it ready in less than six months. And that is just what they did. The marketers at the AAA wanted answers to simple questions. Who is most likely to want cruises to Hawaii? It took a month to get the answers. At any given time there was a backlog of 200 to 300 requests. Six programmers were kept busy writing code to get the answers. The 102 different legacy feeds had different formats and were in many different languages. There was no contact management or promotion history available to users. The AAA marketers had no way of knowing if they had talked to a given customer recently or what the message had been. The team determined on some simple, but important business objectives. Instead of building a warehouse, they wanted to solve immediate marketing problems by building a robust profile of each customer with a cross product view. Since the 80 offices were scattered throughout the state, they wanted a point and click campaign system which could be accessed through the Internet. Using the web eliminated the need for setting up a costly statewide LAN system. They wanted the new system to support the AAA’s new Siebel customer care system as well as several new membership systems. Overall, they wanted the database system to function with minimal support from IS. From experience they knew that business users had to have tools that they could use. 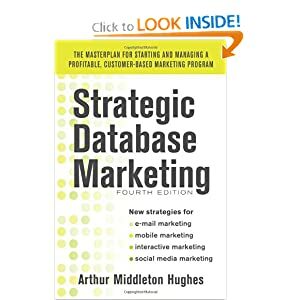 In any organization there are always a few power users who really understand marketing databases. That was not good enough for the team. They wanted to reach the hundreds of marketers who wanted something they could use to make their customer retention and cross selling programs work better, without their having to know advanced computer programming or statistical analysis. Finally, they wanted to use the new system to break down the data silos that existed in the AAA. They wanted something that would show each customer’s usage of insurance, travel, emergency roadside service, the Web, claims and automotive products. Their first job was to sell the system to top management, which had at first asked for a data warehouse. What management really wanted was to see what their customers looked like. So the team told them: “Lets do a marketing database. Instead of amassing together all the information in the company, lets just collect the data that pertains to our customers.” They knew that if you can get a home run early on, and prove that your system is working, you are much more likely to get top level support for it and get your other business users to support you. They knew from experience that there are naysayers in every company. They had to have some early successes to prove the system. What is an early success? By studying the available data, they discovered that if you can increase the retention rate on automobile insureds by only 50 basis points, you can increase profits by $6 million a year. That was an achievable objective with the data mart that they set out to build. What were the requirements for the new system? It had to include a campaign manager. It needed to have a flexible table structure to support SAS and Cognos. It had to support multiple feeds from multiple sources. It had to have scalable growth. They built it, at first, for only a few users and a few projects. But the system had to be capable of expanding rapidly to handle thousands of users, millions of customers, and thousands of simultaneous projects. From their experience, Alexandra and Daniel knew that the build process had to be out-sourced. They issued an RFP to a dozen different vendors. A key feature of the RFP was a built-in user acceptance test. It had to be point and click, work through the web, and give answers to specified ad-hoc questions in a specified number of seconds. Until the software met these tests, the vendor could not be paid. As various vendors qualified on the RFP process, the team visited various vendors’ clients, including Schwab, Autodesk and Macromedia. In the end, they picked Epiphany, a Silicon Valley startup as their vendor, after reviewing the capabilities of such well-known vendors as Valex, Prime Response, Cambridge Technology, and Paragren. A site visit to Epiphany convinced them that this vendor would provide them with high quality people who would be with them throughout the project. The original Epiphany product did not support Oracle, which the AAA wanted to use. Alexandra and Daniel wrote Oracle support into their contract, and Epiphany modified their product. The project methodology involved a phased approach getting the data mart up and running right away to handle membership, emergency road service and other basic requirements. Integration with the travel service was reserved for phase two, and the Insurance and Claims systems saved for phase three. They also included a blueprint for a data warehouse in case the AAA ever decided to go ahead with one. They required Epiphany to provide strong documentation of every step, with all the work being done at the vendor’s site. Epiphany started by analyzing the feeds from the 102 legacy systems in detail. To make sure the tools were useful to business users, Alexandra and Daniel selected 15 people as a beta test group. They gave this group the tools first. The group helped them to debug the system and get it up and running. At the same time, they developed an exit strategy. If something went wrong, they wanted to be sure that they could stop and shift quickly to another approach. Fortunately, that wasn’t necessary. They got the data mart up and running, producing useful output for the 15 users in six weeks. Phase two focused on the use of the travel data. There was lots of operational data, which had never been used before. Using the system, they could develop a profile, for the first time, of who uses the travel service. It gave them an important home run that convinced management of the benefit of the system. This phase also included the new campaign manager. The return on investment from this system was very high. They developed, for the first time, a standard file layout that was used for all functions throughout the state. Phase three involved adding the Web data, the Insurance program and the Claims system. The server selected was a Compaq 45000 which included four 400 Mhz processors, four gigabytes of RFM, sixteen 18 Gigabyte disks, a SQL 7.0 Enterprise query tool, and Microsoft Internet Explorer 4.0 as the web browser for the users. One year after launch, there were now 150 business users who had direct access to data and were using it in their marketing programs. They used easy analytical tools, which they accessed over the web. The old practice of queuing of requests was ended. There were now no paper reports in the system. Everyone got and printed what they wanted directly on their own printers, working through the web. The campaign manager was up and running. This system cut the time from getting a mailing tape out from two weeks to two or three days. Two years worth of promotion history was loaded into the system from over one hundred legacy systems. They now had a cross-functional view of their members, with lifetime value computed and appended to each member’s record. The database is updated once a month. Later, when the Siebel system is installed, they plan to update the system daily. There are 300 data fields in each customer record, including overlays and Polk data. The Epiphany system serves to answer any straightforward data question. For more complex queries, it is still necessary to write a program. Compared to a data warehouse, the California AAA marketing database is laughably inexpensive. The total cost, from start to finish in the first year was $1.2 million dollars. To maintain the system there is one person for training, one who maintains the data mart, and one who is in charge of content. These three people maintain a system that, at present, serves 150 users throughout the state. A year ago, only six people throughout the system had access to the data. Within the next year, the system will be extended to 2,000 users, all of whom will be able to access the data from their PCs through the Web. Probably the most important lesson learned was that the “start small and start fast” approach really worked well. Instead of taking two years to build a giant warehouse, the team had a functioning marketing database up and running in six weeks. Concentrating on fifteen users for testing was a brilliant stroke. These users furnished valuable feedback to the organizers, rather than having users taking their gripes to management in the development phase. Now that the database is up and running and being expanded to 2,000 users, the California AAA will, for the first time, be able to send personal messages to all customers based on their actual use of products, their demographics, their expressed preferences, and their prior promotion history. This has never been done before. Although there are over 90 AAA clubs in the US, the California AAA was the first to develop an attrition model and the first to have a lifetime value score in the member’s database records. They were able to target retention programs towards high value, highly vulnerable members. This enabled them to beat their highly aggressive retention goals with numbers over 80%. It is absolutely amazing that so much has come from an investment of $1.2 million in such a short time by a couple of very experienced and skillful marketers.